Welcome to the fourth page of a handbook on self-hosting. Begin here. Read the previous page here. On this page, we’ll cover how to handle self-hosting administration, from system updates to making sure your containers are in tip-top shape. What’s self-hosting administration all about? Hi there! This is a blog post from the people behind SSD Nodes. We’re the first honest-value VPS provider. Instead of inflating costs, our engineers developed a lean infrastructure that lets us offer up to 10x more RAM per dollar than the competition. Ready to learn more about what you get from an honest VPS provider? Here’s a hint: Our 24GB RAM Standard VPS is only $9.99/mo. Generally speaking, a self-hosting infrastructure requires quite little in the way of maintenance and upkeep. Of course, the stakes depend entirely on your unique application. I’m using my self-hosting stack only for myself, and I’m not running any services I couldn’t go without or duplicate with another app/service I already have on my machines, so I don’t worry about things like nine nines of availability. For example, my self-hosted Nextcloud folder also syncs up with Dropbox via a symbolic link on my desktop, so all my critical files are within reach if (and probably when) I bring my VPS down. Check running containers. If you’re already hopping onto your VPS to perform an update, while not also run a quick docker ps?. I’m embarrassed to admit this, but I’ve created test servers with… lax security practices, only to find my VPS running some cryptocurrency miner via a Docker container. A quick ps ensures you know what’s going on, whether that’s a breach or merely a container gone awry. Create backups! While you can destroy and recreate containers at will without losing your data—thanks Docker volumes!—you can’t predict a catastrophic event. I use a second server as a backup server, and use Borg to synchronize files from one to the next. There’s no automatic restore process, but at least the data duplicated. We’ll soon be posting a guide on backing up your VPS to your local machine, and I’ll be sure to link it here. Of course, you’ll also want to do some best practices on security, such as running a firewall and something like fail2ban to block malicious access attempts. Don’t update the packages inside of your containers. While it’s possible to actually “log into” your running Docker containers using docker exec -it ..., and in theory you could then perform an apt-get update && apt-get upgrade inside of them, I strongly discourage this. Many Docker images are crafted using specific package versions and configuration files, which could conflict or be overwritten via an upgrade. We’ll cover smarter updates in a moment. Stay away from the docker-compose down command. Running docker-compose down will stop running containers and delete them, and then delete associated volumes and networks. Your data should remain within the volume folders that you specify in your docker-compose.yml file, but it’s better to be safe than sorry. If you need to stop containers, use docker-compose stop instead. In theory, updating your Docker containers is easy. In practice, it may be more complex than the following explanation makes it seem. Each container is based on an image. These images are kept in the Docker Hub and pulled to your machine when you first ask Docker to run a container. The developers who create these images might update them, for example, to use a newer version of PHP. If you want the latest and greatest, you’ll want to update your images and then use them to recreate your containers. The first command will pull all the newest Docker images from Docker Hub and then recreate them as needed. 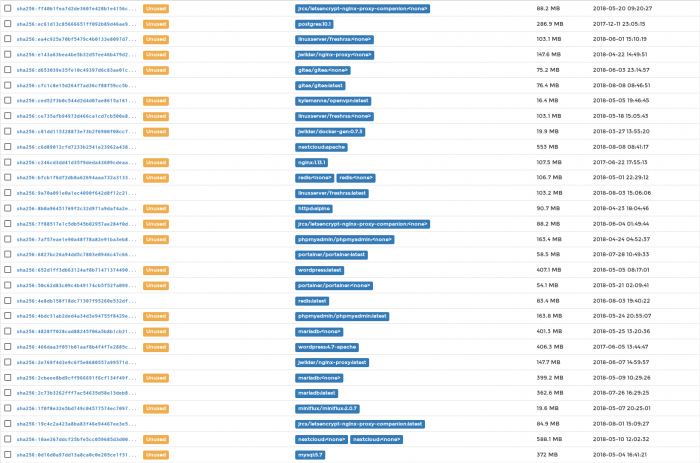 As you can see, Docker pulled a handful of updated images from Docker Hub and recreated them, all without any hassle. The reverse proxy took about 15 seconds to re-register all the services, and everything was back up and running! If there are existing containers for a service, and the service’s configuration or image was changed after the container’s creation, docker-compose up picks up the changes by stopping and recreating the containers (preserving mounted volumes). To prevent Compose from picking up changes, use the –no-recreate flag. Many apps have their own update mechanism. Nextcloud, for example, will automatically update its codebase via another system entirely, which makes updating the Docker image useless. Without volumes, you’ll lose data. If you don’t set up your docker-compose.yml file to use Docker volumes for your data, and instead store data inside the container itself, you’ll ax it during the recreation. Better to use volumes at all times. Beware of complex migrations. Let’s say that a service you’re self-hosting has moved from one major version to another, which includes a complete refactoring of how it accesses its database. The developers behind this service need everyone upgrading from one version to the next to perform a specific migration process. If you pull the new image without performing the migration, you’ll run into issues in this example. Fear not—such migrations and special upgrade processes are rare, but prove the point that performing updates without any research and planning can lead to big headaches! All in all, these Docker images are taking up 5.7GB of disk space, whereas, by my back-of-the-envelope addition skills, the used images should only need about 1.5GB of disk space. That’s quite a bit of unnecessary overhead! As with all good and growing things, there comes a time for some pruning. You’re safe to run docker system prune whenever you feel like your disk space is rising—it all depends on how often you’re creating/destroying containers, updating images, or trying (and perhaps abandoning) new images. You might have noticed that, in the image just above, I removed many Unused images, but not all of them. That’s because docker system prune deletes only dangling images, not unused ones. If an image is dangling, it’s also unused, but an image can be unused but also not dangling. Got it? Since I don’t feel like keeping an OpenVPN image around any more, it’s time to dig a little deeper. Docker has created a number of prune commands, and this time, we’ll use prune in combination with docker image. We’ll also add a -a option to specify that we want to remove all unused images, not just dangling ones. With these cleanups, Portainer now reports the expected 1.5GB disk space used by Docker images—no more bloat! You can also remove all unused images via the docker system prune command if you add the same -a option to the end of it: docker system prune -a. I do them separately, but the results should be the same. The prune command also works with other Docker systems, such as docker network prune, docker container prune, if you’d like more specificity with how you clean up your self-hosting stack. A note on volumes: You might have noticed that by default docker system prune doesn’t touch volumes. That’s because volumes are where your personal data is kept, and one accidental delete will mean you’ve lost your data. You can try pruning volumes via docker system prune --volume or docker volume prune, but I can only recommend you proceed with caution. I’m not about to run either of those on my own system, thank you very much. If you want to take your self-hosting experience to the next level, and either have a secondary (or even tertiary!) VPS available to you, I highly recommend looking into Docker Swarm. You can combine your docker-compose deployment scheme with Docker Swarm to create a load-balanced, self-healing infrastructure, which is pretty darn neat. For now, this process is going to remain outside of the handbook’s scope, as I think most people won’t need a cluster for self-hosting. But, for those who are curious, we have an excellent tutorial on getting started with Docker Swarm. The fifth page—Self-hosting Nextcloud with Docker—is now available! The sixth, seventh, and nth pages of this handbook are coming soon. Next, I’ll cover how to add specific apps, such as Nextcloud or just a plain ‘ol Nginx web server, to this stack.